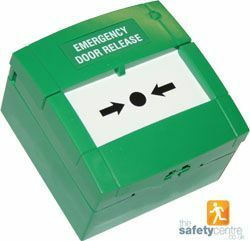 Along with traditional fire alarm call points The Safety Centre can also supply green emergency door release break glass units for use with access control systems. These Access Control Break Glass units come with a glass element and test key. For more information on these products call us NOW on 01200 428 410. This product is designed to unlock a access control door in the event of an emergency once the glass has been broken within the unit. The device pictured above is manufactured by KAC who are one of the worlds largest specialist break glass unit manufacturers. They manufacture call points for a wide variety of applications in an assortment of colours. These applications include intrinsically safe call points and weatherproof call points for use in external locations. Aswell as the KAC unit, we can also supply the Fulleon Green Access Control Break Glass. This device features the familiar Fulleon styling and again allows the release of an access control door once the glass has been broken in the unit. If you’re interested in these products you may also be interested in our Fire Alarm Panels and Wireless Fire Alarm System ranges.